WARNING: If you're sensitive to flashing images, you probably shouldn't watch this as it contains loads! 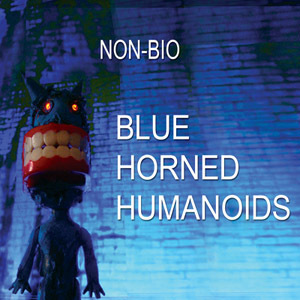 Track 9 from the album Blue Horned Humanoids, and the first Non-Bio vid to be entirely Flash animated. Just after sunrise this morning, Marius and I decided to use the eerie quietness of Croydon on Christmas Day to make a new Non-Bio video. The album has been reviewed and given a not-shabby score of three and a half out of five! Short but sweet! Full details of the magazine here. Interesting that they mentioned Microsleep, as Music For Maniacs liked that track too and have put it on their latest free download compilation. Yes, after a slight delay, here it is on good old fashioned shiny disc. From here (courtesy of Burning Shed). The album is here. Available as download or on CD. There will also be a limited number of CD digipaks to own, exact details of these to follow soon. It's also remotely possible I'll be wandering around Cybersonik Festival at the Camden Underworld that evening with a few copies in hand, hijacking other people's gig to cynically whore my own worthless music.